In these lessons, students will engage with the themes and ideas at the heart of the text, including fate, love and violence. Tasks include: a close reading of Romeo and Juliet's sonnet in Act 1 Scene 5; exploring the idea of words as weapons and how characters like Tybalt wield them; and a card game which will help connect themes to characters and the text. Can I explain what is meant by ‘theme’? Can I list some of the key themes of Romeo and Juliet? Display the ‘Props’ PowerPoint, which shows a montage of images connected to the plot of Romeo and Juliet. This is available in the Downloads section at the bottom of this page. Students should first of all identify as many items as they can from the montage (e.g. heart, rose, dagger, vial of poison). They should then pick out as many ideas, themes and issues as they that are suggested by the images (e.g. love, violence, war). Students are given pieces of paper which represent plaques for statues. They should write down the key themes of the play on these plaques, e.g. conflict, family, love, fate, time, beauty, death, friendship, etc. Imagine that Prince Escalus wants to erect statues around Verona for citizens to look at and learn from. Students should work in pairs or threes to sculpt themselves into thematic statues. Which statues would Prince Escalus choose? You could play the role of Escalus, selecting the statues and justifying ‘his’ choices. As an extension activity, students could embellish the plaques by having an appropriate quotation from the play engraved onto each plaque. There is a page to create some theme ‘plaques’ in the Student Booklet. SERVINGMAN: I know not, sir. ROMEO: O, she doth teach the torches to burn bright. Beauty too rich for use, for earth too dear. As yonder lady o’er her fellow shows. And, touching hers, make blessed my rude hand. For I ne’er saw true beauty till this night. imagery of riches, jewels, etc. Now ask students to look for more quotations where Juliet’s beauty is described by Romeo. You could use an online concordance to begin with and search for the word ‘beauty’. You could also focus on scenes of courtship, such as Act 1 Scene 5 and Act 2 Scene 2. Also look at how Juliet praises Romeo and describes her attraction to him. What would I say are the main themes in the Romeo and Juliet? What kinds of connections can I make between these themes? How might a director draw out these themes on stage? In small groups, prepare a performance of the Prologue to Romeo and Juliet accompanied by actions. How many of the play’s themes can students include in their performance? Students could make Valentine’s cards or love letters for Rosaline and Juliet, in the character of Romeo. Use some of Romeo’s quotations about attraction and beauty, and make a display of them. How do Romeo’s feelings for the two women compare? Students could also research the theme of beauty in other plays by Shakespeare. Each of the themes mentioned in this suggested learning sequence has a dedicated lesson within these materials. In depth activities linked to ‘Conflict and violence’ and ‘Romantic Love’ follow here within the Key Stage 3 materials. Within the Key Stage 4 materials, there are activities linked to ‘Truth and secrecy, ‘Family’, ‘Age and Time’ and ‘Death, fate and tragedy’. You will also find detailed guidance on writing about themes. 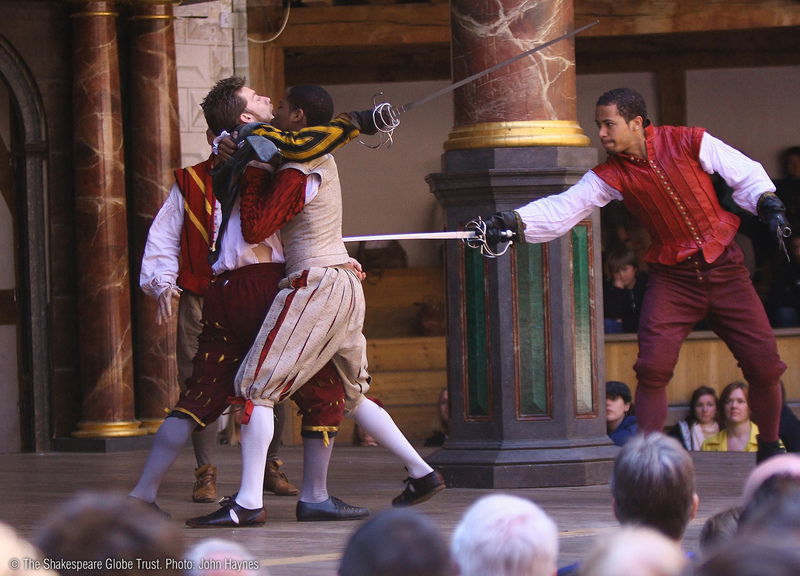 Can I investigate how Shakespeare establishes and develops the themes of conflict and violence in Romeo and Juliet? In fan fiction, people create their own stories based on characters and locations from a well-known fictional world. Stories set at Hogwarts or in Middle Earth are popular examples! Give students a few minutes to brainstorm ideas about how they think the feud between the Capulets and Montagues might have started and share ideas. The Student Booklet provides students with copies of Rex Gibson’s Insult generator, from p. 199 of his book Teaching Shakespeare. Students could warm up by producing single insults and if they have time, they could prepare and rehearse a brief dialogue. Remind students that all the insults are Shakespeare’s. Can they identify which ones come from Romeo and Juliet? This particular version of this activity was devised by Bill Buckhurst when he was directing Romeo and Juliet in 2008 at the Globe. Pairs of students label themselves A and B and stand facing each other, so that all students are arranged in two lines. They pretend to send a weapon to their ‘enemy’, possibly adding a sound effect. Students take it in turns to hurl imaginary weapons - and to react to the weapons that hit or miss them - for no more than a minute. Students could then apply this technique to a piece of text and to the character who is most vocal in that conflict, e.g. Tybalt in Act 3 Scene 1. Assign a line from this character to each student, and then ask the students to identify the most hurtful or damaging word in that line. Students should now hurl that word to their opponent and vice versa. Discuss afterwards which words were the most effective weapons and why. Sitting in groups of nine, students should be assigned a character from Act 3 Scene 1. They should also be given a ‘cue script’ for that part. This consists of only the lines that character speaks (in the order in which they are spoken), and the three cue words spoken by another character before each of their lines. students could even construct their own cue scripts using an online version of the play text that they can cut and paste as needed. Students should work together – without a director - to develop their understanding of and confidence with this scene. Every time they read their lines they should think more about how they should speak, how they should move and why, using the clues in the text itself. To what extent is Romeo and Juliet a play about conflict and its consequences? How would you present the conflict in the play to audiences? Which non-violent scenes contain conflict? Can all of the violence of the play be explained by the conflict between the Montagues and the Capulets, or are there other causes? Students should create a colourful, illustrated mindmap with the word ‘conflict’ or ‘violence’ in the middle. As they read the play, they should add ideas relating the ideas of conflict and violence to the play’s characters, their situations and problems, their relationships and their motivations. At the time Shakespeare was writing Romeo and Juliet, England was divided following Henry VIII’s split from the Catholic Church in 1533. Bitter feuding between Protestants and Catholics would have been an everyday reality for young men like Shakespeare. Students could develop their ideas about how the feud began into a piece of creative writing. Can I investigate how Shakespeare establishes and develops the theme of romantic love in Romeo and Juliet? The video to Des’ree’s ‘Kissing You’ song from Baz Lurhmann’s Romeo + Juliet could be playing as students enter the classroom for a lesson on this topic. Students could make a note of motifs and symbols that are associated with love in the video. Take feedback. To smooth that rough touch with a tender kiss. And palm to palm is holy palmers’ kiss. ROMEO: Have not saints lips and holy palmers too? JULIET: Ay, pilgrim, lips that they must use in prayer. They pray; grant thou, lest faith turn to despair. JULIET: Saints do not move, though grant for prayers’ sake. ROMEO: Then move not while my prayer’s effect I take. JULIET: You kiss by th’ book. 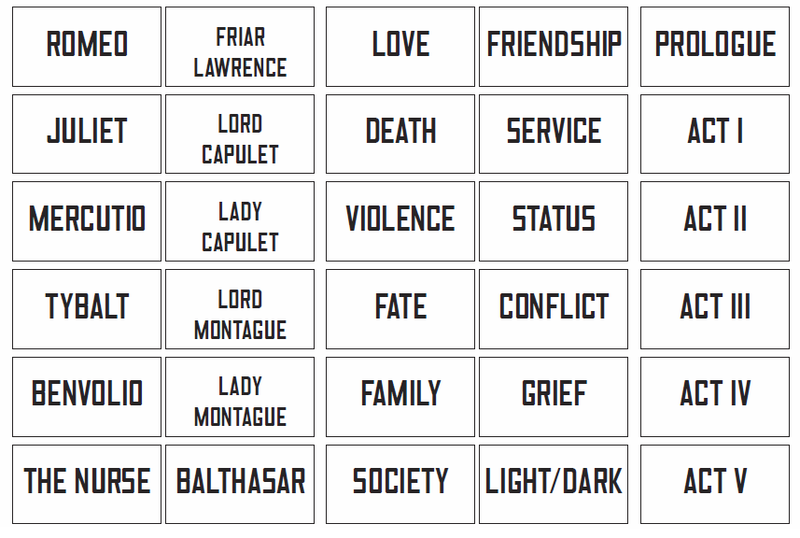 Discuss with students the effect of Romeo and Juliet’s first words together forming a sonnet. As an introduction to this task, students could watch this scene in the Zeffirelli and/or the Lurhmann version. Take some brief feedback from students about what they have noticed and what they enjoyed. 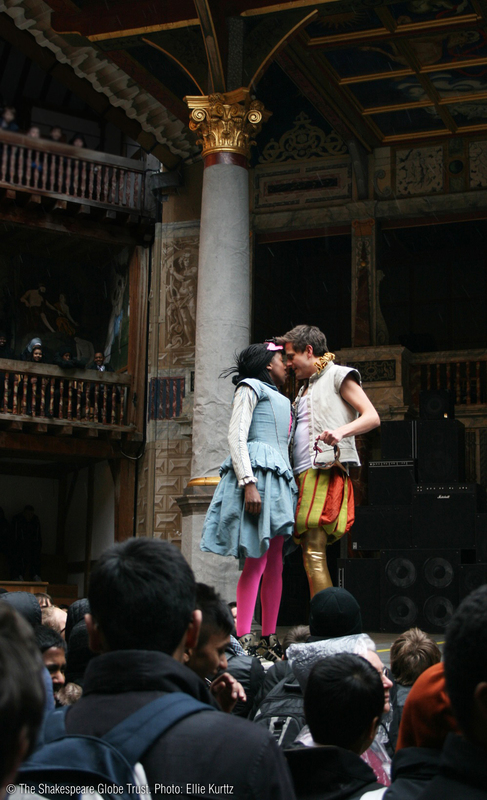 Then watch the footage of this scene below from the 2013 Globe production, starring Will Featherstone and Jade Anouka. Students could make notes in the Student Booklet about different ways in which the scene has been staged, how it could be staged, and the effects of different choices. 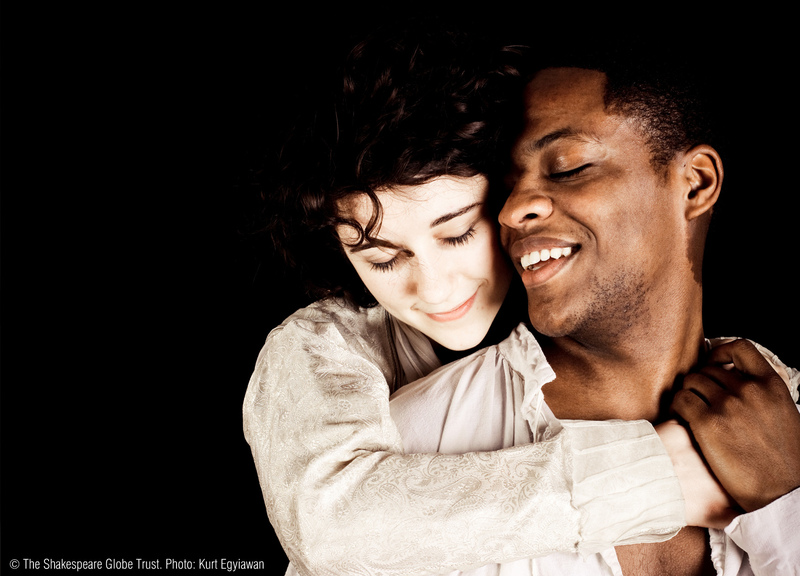 In Act 3 Scene 5 lines 1-64, Shakespeare presents Romeo and Juliet’s short-lived happiness together as a married couple. Students could then discuss their own ideas about staging this scene and the effect they want this scene to have on the audience. Students should create either a storyboard with speech bubbles for quotations, or an annotated script to indicate their ideas about directing this scene. Students can draw on interests in drawing, collage, photography, dance, etc. to develop their personal responses to this task. There is a page for students on writing a commentary linked to their storyboards in the Student Booklet. (One version of how to stage this scene can be viewed in the link below. Students could compare this with the version from the Globe DVD and/or from other film versions too). 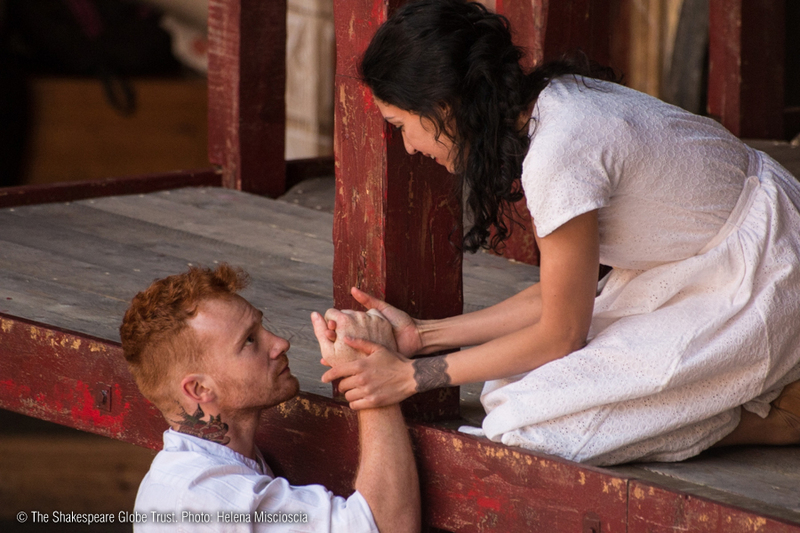 How does Shakespeare convey the intensity and sincerity of Romeo and Juliet’s love for each other? What are the factors that prevent Romeo and Juliet’s love story from having a happy ending? In Shakespeare’s comic play A Midsummer Night’s Dream– written at around the same time as Romeo and Juliet, and seen by many as a companion play to it – Lysander says ‘The course of true love never did run smooth’. Discuss the truth of this quotation in relation to Romeo and Juliet and, if students are sufficiently familiar with it, to A Midsummer Night’s Dream too. What do the two plays have in common? Shakespeare and his contemporaries often wrote action for the upper level of the stage. The use of the upper level in this scene means that Juliet is both safe at home and at the same time visible to Romeo, allowing for an extended moment of intimacy. The word ‘balcony’ might have been unknown to Shakespeare. Our first record of it in writing dates from two years after the play was written. Although Shakespeare says that Juliet appears ‘aloft’, the convention of Juliet appearing on a balcony only became commonplace after David Garrick used a balcony in his adaptation in the eighteenth century. The storyboard/annotated script activity on Act 3 Scene 5 lines 1-64 could be accompanied by a commentary and used as an assessment piece.